Slides from PhD student, Jo Hodge’s presentation on 31.01.11. Jo’s talked about her Masters project where she used thermochromatic inks to create garments which changed their appearance. The driver behind the project was to create garments that had an emotional significance to the wearer and encouraged them to interact with others. Jo talked through the method she used to engage potential wearers including cultural probes,prototyping and testing through exhibiting at public events. 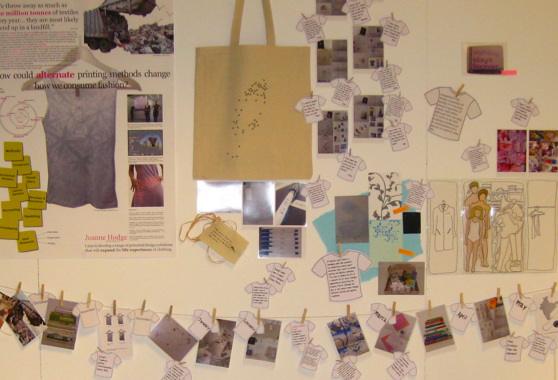 Following the Master of Design Programme at Dundee, Jo worked on a Knowledge Transfer Partnership with Tayside Police, JD Wilkie (technical textiles) and the Textile Department at DJCAD. She is now studying for an Arts and Humanities funded PhD with Professor Mike Press and Hazel White, with specialist advice from Polly Duplock. You can see Jo’s slides here (M.Des students and staff only).